One of many options is the running of our Academic Year. Traditionally in the US, school runs fall to spring with summers off. This is a wonderful option, one which many homeschoolers follow for their Academic Year. 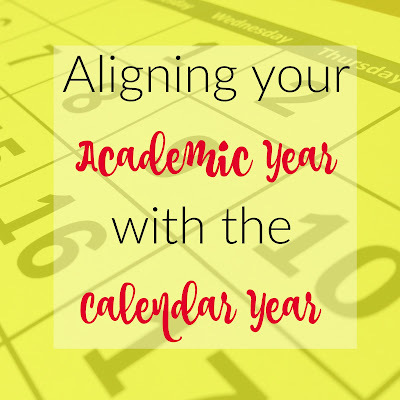 I would like to present another option, which is to align your Academic Year with the calendar. 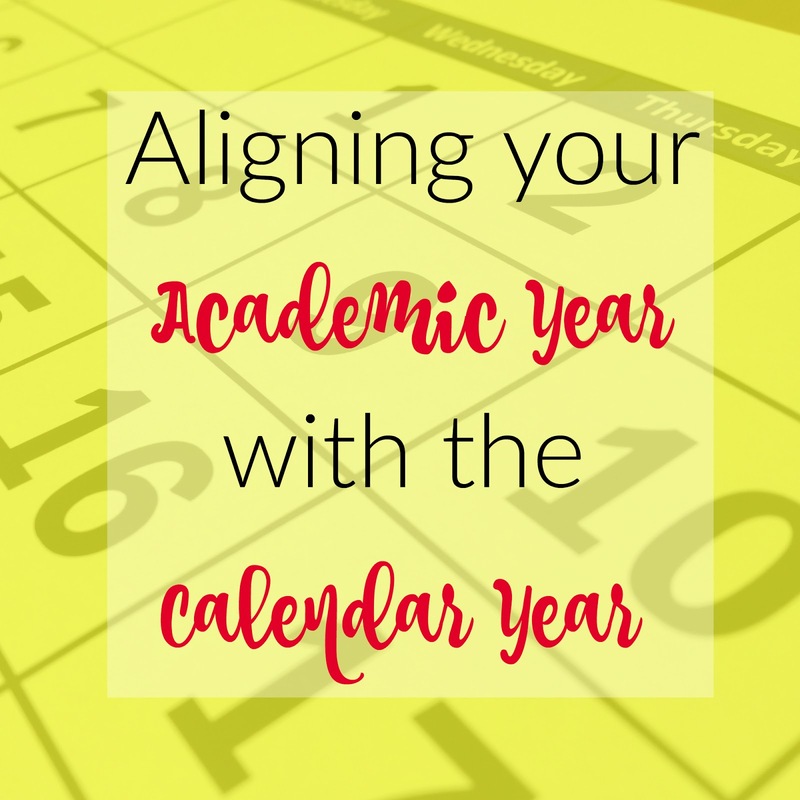 We fell into aligning our Academic Year with the Calendar Year naturally. My oldest has a birthday in October and our local school district has its cutoff date as August 1. She was entirely ready for "school" at just turned five - reading well and in need of some structure to her days. While we always knew we'd home educate, and in Ohio we're required to notify in the fall after the child turns 6, M-girl was ready to start. So, after Christmas and N-boy's fourth birthday early in January, we did. There were other practicalities to using a calendar year. First, the season from Thanksgiving and Advent through Epiphany is my very favorite part of the year. I knew we wanted to mostly take that time off from formal schooling in order to do baking, crafting, traveling around. We call it our Yuletide Session (more on this year's plans later this week, but here's a post from 2013). I still consider Yuletide Session a lot of educational hours, just not as formal educational time as we do the rest of the year. I like to be "done" with nothing hanging over our heads during this season and the emphasis on the new in the new year is a wonderful impetus to begin again and enjoy having some traditions for the "start." Second, I knew we wanted to school "year round." I knew we would want to have a daily routine or schedule, I knew we would want to not take a big summer break where we forget a lot of things. I knew that discipline issues increase when children (and mommies) are left to themselves. Mystie wrote a brilliant piece yesterday about Year Round schooling using six-week intervals. She has had a great influence on me and in 2015, we changed from "breaks when we want" to six-week intervals. You can do anything for six weeks and "you just had a break" and "it's almost break week" are great incentives to all of us. This change has been a rousing success and we will continue the practice. Third, my husband likes the schedule. It makes sense to him as we aren't living an agrarian lifestyle in any way. He likes to say we aren't "tied to the man." That makes me giggle every time. But what I like about it is that it is very freeing. I don't feel pressures the same way to finish or start anywhere but where we are. Officially, we're about 8 weeks behind the AO Year 4 schedule. We've had a rough illness year - I had shingles in the spring and the children took turns passing around illness for several weeks. I messed up my arm this fall. We relied a great deal on Netflix documentaries and Khan Academy during the spring time. It was fine. In January, we'll just pick up where we left off. We might try to consolidate and catch up a little, but we might not. We keep moving ahead and learning together. If we finish something during the year, we just start the next work. It's a family culture of learning we're after. Finally, at the end, when I have seniors in high school, we'll have five or six months for an independent study time. I plan to assign, encourage, and facilitate a time of free inquiry, of digging deeper into an interest, a profession, or a topic of their choosing. But we're free; if we don't get there we don't get there. There's another benefit to calendar year schooling. We get a big boost from January being the start of a new year. New school supplies, organization, planning. February is in the first six weeks, and we rarely hit February dismals ... plus our first break week hits in February. August we get another boost when everyone else is in back-to-school mode. October and November are push through to finish for the holidays. This is not to say that we don't slump, but our slumps seem mitigated to some extent. Because we're Charlotte Mason educators, we try to finish as early in the day as we can, so we can still have a lot of free time in the afternoons anyway. We always have to explain that we homeschool and our schedule is different. All that "go and do" in December? A lot happens during the school day and we get many questioning looks. So be it. I try to turn it into an opportunity to share about homeschooling and its benefits. "When do you promote grades?" Like other homeschoolers, we use grade levels for two reasons: to answer "how old are you?" by strangers and Sunday School placement. In September, we tell our kids what grade they would be in if they were in public or private school. Even if they're "advanced" or "behind" in some area or another. Most online classes - even for homeschoolers - begin in the fall. Sports seasons are based on the "school schedule." If we take advantage of PSEO courses, those are on the traditional schedule. Frankly, we'll face these challenges as we go. My main thought is that we take advantage of those options as we can and don't worry about where they fall in our schedule. In Ohio, we have to report before the first day of school in August and include a list of resources we're using. I simply list what we're currently using and send it in. No matter if we'll finish it next week and start the next thing. I never send everything we're doing, just the minimum anyway. I think the main thing to remember when Aligning your Academic Year with the Calendar Year is freedom. We are free to build a family culture and make learning a lifestyle as we see fit. So are you. That culture and lifestyle works best when it's flexible, refuses to compare or worry, and acknowledges that there is no real "beginning" or "end" to learning and loving. For other great homeschool posts, check out The Homeschool Solutions Show. Dawn, I really enjoyed this post. :) When I was a senior in a public high school, I graduated a semester early and started college at the community college, so I love your idea of letting your seniors have an independent learning semester. That's very interesting, Mariel. I graduated from college a quarter early and started subbing before a lot of my fellow classmates could. I really would like that last project to be a culmination of all their learning and how their faith impacts and drives the study. We'll see; it's a long way off. Love this, Dawn. We are going to pick up your concept this Jan. This is pretty much what we do too, Dawn! Love your perspective on family culture formation and learning. Thanks for the inspiration to keep on doing what works for us. Hi! I found you from Pam Barnhill's audio series. I am interested in the year round homeschooling and starting in January. Any advice on how to do that when you took the summer off and had in mind to start 'when everyone else started' in late Aug/Sept? How do you get on that schedule when you have been on a 'traditional' school schedule? Thanks!